The mansion that stood here was demolished in 1981. It was a large, red brick 19th century house in Jacobean style. It had several bays, a conservatory and cellars. Inside, there was an imitation Jacobean plaster ceiling in the main downstairs room, some good fireplaces and servants' bells. The sundial in the gardens had a plate which may be of some antiquity. Large red brick 19th century mansion in Jacobean style; not of outstanding quality, but interesting. In two sections - western, dated to 1830 by former owner, apparently correctly, retains its Georgian windows on west wall. The north (rear) wall has three gabled 'wings' (hardly projecting) with round-headed central doorway. In 1862 this block altered by addition of bay windows with strapwork in Jacobean style. New block added on east with two massive bay windows and ogee porch between, and attics above. Remarkably there is a drop of several feet between first floor of the two blocks. A recessed block projects further east. On west a conservatory with passage behind to new front door dated 1862. Several cellars, some with wine bins, one with huge safe door. Imitation Jacobean plaster ceiling in main downstairs room: some good fireplaces, servants' bells etc. Initials ETMSPY appear all over exterior. Sundial in gardens has plate which may be of some age. First visited by E. Rose (NAU) 15 September 1977. Interior and photographic survey pre demolition July 1981. The ogee porch, an ogee doorway and other fittings have been built into Cantley House, Hethersett (NHER 14209). The older part of the Hall was built by George Stanley Repton, fourth son of Humphrey Repton, who died in 1858 and so could not have been responsible for the 1862 section unless he left posthumous plans (as indeed his father did for other cases). E. Rose (NLA), 31 May 2007. 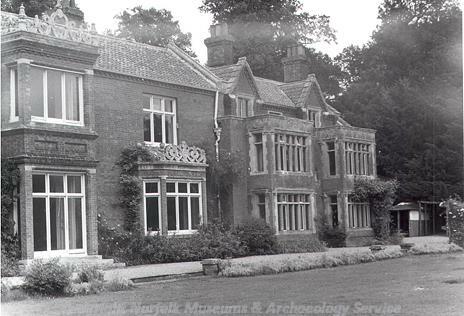 --- Photograph: Photographs of Burgh Hall,Burgh-Next-Aylsham. Black & white. --- Photograph: BYG 13-18, BYH 14-20.